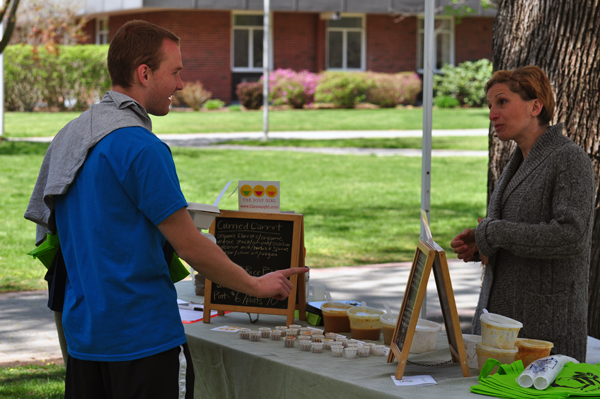 Quinnipiac hosts an Earth Day fair and held a famers market. A Quinnipiac student handing money to the employee of The Cheese Truck, Thursday outside of Burt Kahn during the Earth Day fair. A Quinnipiac student at the farmers market, Thursday outside of Burt Kahn during the Earth Day fair. A Quinnipiac student planting a flower, Thursday at Burt Kahn during the Earth Day fair. A Quinnipiac student getting interviewed, Thursday at Burt Kahn during the Earth Day fair. A demonstration being held, Thursday at Burt Kahn during the Earth Day fair. A Quinnipiac students on a cardio bike attempting to produce as many Watts of electricity that he can in 2 minutes, Thursday at Burt Kahn during the Earth day fair. The environmental magician preparing himself, Thursday outside of Burt Kahn during the Earth day fair. Bread being sold outside at the farmers market, Thursday outside of Burt Kahn during the Earth day fair. Organic popcorn being sold to Quinnipiac student, Thursday outside of Burt Kahn during the Earth day fair. A Quinnipiac students deciding what to buy at the farmers market, Thursday outside of Burt Kahn during the Earth day fair. Quinnipiac students listing to a presentation, Thursday at Burt Kahn during the Earth day fair. A Chartwells chef preparing an organic meal, Thursday at Burt Kahn during the Earth day fair. A Quinnipiac students planting herself a plant, Thursday at Burt Kahn during the Earth day fair. An hand-made bracelet being put on to a students hand, Thursday at Burt Kahn during the Earth day fair. A Quinnipiac student holding up a plant that she made for herself, Thursday at Burt Kahn during the Earth day fair. 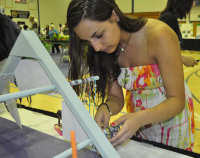 A Quinnipiac student choosing hand made jewelry, Thursday at Burt Kahn during the Earth day fair. Organic makeup being sold,Thursday outside of Burt Kahn during the Earth day fair at the farmers market. A woman at the farmers market making fresh cannolis, Thursday outside Burt Kahn during the Earth day fair. A Quinnipiac professor opening a bag of organic apples, Thursday at Burt Kahn during the Earth day fair. An environmental magician making a water bottle stand on a 45 degree angle, Thursday at Burt Kahn during the Earth day fair. A Quinnipiac student taking a bite down on a organic apple giving out Thursday at Burt Kahn during the Earth day fair. A farmers market employee, Thursday outside of Burt Kahn during the Earth day fair. Livestock outside of Burt Kahn, thursday during the Earth Day fair. A farmers market employee selling his flowers, Thursday outside of Burt Kahn during the Earth Day fair. Organic products being sold,Thursday outside of Burt Kahn during the Earth day fair Farmers market. A farmers market being held, Thursday, outside of Burt Kahn during the Earth day fair. Information boards lined up next to each other, Thursday at Burt Kahn during the Earth day fair. Ilya Spektor of Students for Environmental Action poses at a table during the Earth Day fair Thursday at Burt Kahn. A Quinnipiac student removing excess dirt from flowers he had planted, Thursday at Burt Kahn during the Earth day fair. A Quinnipiac student at an information booth, Thursday at Burt Kahn during the Earth day fair. A chef from Chartwells cooking up organic noodles for students, Thursday at Burt Kahn during the Earth day fair. Quinnipiac students looking at display boards, Thursday at Burt Kahn during the Earth day fair. Quinnipiac students planting their own flowers, Thursday at Burt Kahn during the Earth day fair. Quinnipiac students looking at information boards, Thursday at Burt Kahn during the Earth Day fair. A Quinnipiac student picking up a snake from its cage, Thursday in Burt Kahn during the Earth Day fair. Quinnipiac students passing a snack to one another, Thursday at Burt Kahn during the Earth Day fair. A Quinnipiac student holding a snack during the Earth Day Fair, Thursday in Burt Kahn. A booth of flowers outside in the Farmers Market, Thursday outside of Burt Kahn during the Earth Day Fair. Quinnipiac students making an order at The Cheese Truck, Thursday outside of Burt Kahn during the Earth Day Fair. Two Quinnipiac students outside with a plant that they received during the Earth Day fair, Thursday at Burt Kahn.